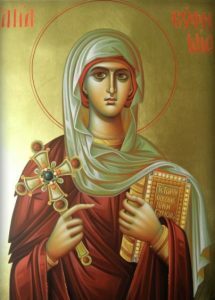 WHY ST. EUPHEMIA THE ALL-PRAISED? She is a confessor of True Orthodox Christianity, a powerful intercessor, and a glorious Great Martyr in the Church of Christ. She is a most excellent patron for our Academy. You can read more about her life here: Our Patron Saint. The GreatMartyr Euphemia Orthodox Theological Academy has decided not to seek academic accreditation by any accreditation agency. Oversight by the Diocesan authority, the Dean, the Academic Advisory Committee, and the governing board will maintain a high standard of academic quality and assure that the mission and vision of the Academy are being accomplished. Official transcripts of a student’s academic record are issued upon request of the student, and sent directly to other academic institutions, potential employers, or diocesan bishops. The fee for official transcripts is $20.00 each. Transcripts will not be issued unless a student has met all financial obligations to the School. One unofficial transcript is sent to each graduating student upon request. GreatMartyr Euphemia Orthodox Theological Academy merchandise and apparel can be purchased through the online bookstore. Show some support for your Academy! The bookstore will be operational soon. Return here to for the link. Ordination is at the sole discretion of the student’s Bishop. Any requirements or conditions set forth herein, including completion of the Academy’s course of study in Orthodox Theology, may be waived by the Bishop at his discretion, and ordination of a candidate may occur at anytime during the course of study as the Bishop may deem necessary.